This article is about the Metroid series in general. For other uses, see Metroid (disambiguation). The Metroid series is a series of action-adventure video games published by Nintendo. The story follows the adventures of the space-faring Bounty Hunter Samus Aran as she traverses the universe thwarting Space Pirate schemes to dominate the galaxy. The series is named after parasitic energy-siphoning lifeforms, called Metroids, the origins and fate of which are intrinsically intertwined with Samus Aran herself. The series is known for its strong female protagonist and exploration-style gameplay. The original titles were 2D side-scrollers, and later installments, beginning with Metroid Prime, introduced a first-person 3D perspective. The nonlinear gameplay element often requires the player to backtrack through previously visited areas after acquiring new equipment, which can be used to open previously inaccessible routes. Because most of the titles introduce few or no supplementary characters to interact with, the plot is usually revealed through visual storytelling, textual data analyses that can be downloaded by scanning terminals or objects, or intrapersonal dialogue. The original Metroid was released for the NES in 1986 and is chronologically the first game in the series. After Space Pirates attacked a deep-space research vessel and stole the Metroid specimen the researchers had recently discovered on planet SR-388, the Galactic Federation Police, fearing the Space Pirates would multiply Metroids for their own designs, hired Samus Aran to infiltrate their fortress on planet Zebes. She confronts and defeats Kraid, Ridley, and finally the cybernetic Mother Brain, crippling the Space Pirate operations on Zebes. Return of Samus was released for the Game Boy in 1991. Though it was originally intended to be a direct sequel to Metroid, Return of Samus takes place chronologically between the events of the Metroid Prime series and Super Metroid. The Galactic Federation, fearing the destructive potential of Metroids, sent a special task force back to SR-388 to exterminate them. When contact with the landing party was lost, the Galactic Federation sent in Samus Aran to complete the job. Once on the planet, Samus encounters and eliminates Metroids in various stages of their life cycle, including Alpha Metroids, Gamma Metroids, Zeta Metroids, Omega Metroids, and finally a Metroid Queen. When she encounters the last Metroid, a Metroid Hatchling, it mistakes her for its maternal figure, and she decides not to destroy it in the hopes that it could be studied and eventually used to benefit humankind. She brought the Metroid larva to the Ceres Space Colony and entrusted it to the researchers there. Super Metroid was released for the SNES in 1994 is a direct sequel to Metroid II: Return of Samus. Shortly after leaving the Ceres Space Colony, Samus receives a distress call and returns in time to witness the abduction of the Metroid Hatchling by the creature Ridley, whom she had previously encountered on Zebes. She tracks him back to the planet where the Space Pirate fortress has been reconstructed and traverses the familiar subterranean labyrinths in search of the Metroid larva. The encounters old and new enemies, including Kraid, Ridley, Draygon, and Phantoon, all of whom she must defeat before accessing Tourian, the area where Mother Brain lurks and controls the Space Pirate forces. In Tourian, Samus encounters the Metroid Hatchling, who attacks her and siphons her life energy before recognizing her as its maternal figure and fleeing. After recharging her energy, Samus engages Mother Brain, who has been significantly enhanced since their last encounter, in combat, and is very near defeat when the Metroid Hatchling appears again. The Hatchling attacks Mother Brain, siphons its energy, and then transfers that energy to Samus. Mother Brain recovers, however, and destroys the Hatchling, rendering the species extinct. Samus uses the energy from the Hatchling to destroy Mother Brain using her Hyper Beam, which triggers a powerful self-destruct sequence, which Samus escapes but which completely destroys planet Zebes. 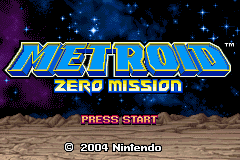 Metroid Fusion was released in 2002 for the Game Boy Advance and is chronologically the final game in the Metroid timeline, following the events of its prequel, Metroid: Other M.
The Galactic Federation hired Biologic Space Labs to observe the restructuring ecosystem on SR-388 following the obliteration of the dominant predators there, the Metroids. Because of her prior experience, Samus Aran was hired to provide field assistance. 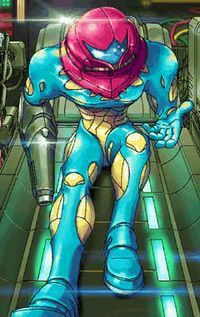 On the planet's surface, Samus encountered a previously unknown parasitic organism know as "X," which infected her without her knowledge. Samus fell into a deep coma and was transported to the Galactic Federation Headquarters for emergency treatment, where surgeons were forced to cut and remove parts of the Power Suit from her body. In a desperate move, the scientists created a vaccine using a preserved Metroid cell culture, which eliminated the X within her. Unexpected side effects included the ability to absorb X parasites, and inheriting the Metroids' weakness to extreme cold. Now clad in the Fusion Suit, Samus is sent to the B.S.L. Research Station to investigate the large explosion that occurred there, overseen by her new ship's computer, which gives her orders along the way. On the station, Samus discovers that specimens brought from SR-388 carried X parasites with them which have infected the entire station. She also encounters an X that mimics her form, SA-X, who stalks her throughout her mission. Deep within the laboratories, she unearths the Galactic Federation's clandestine Metroid breeding operation. What's more, the ship's computer informs her that the Federation has taken an interest in the X parasites and is approaching the station, and had even withheld upgrades from her so that she wouldn't destroy the SA-X. In light of the dangers the lifeforms onboard the station present, Samus decides to destroy the station. While arguing with computer about her decision, it is revealed that the mind of Adam Malkovich, her previous commanding officer who died during the Bottle Ship incident, was uploaded to her ship and was in fact the one issuing her orders. He informs her that she can redirect the station's orbit before detonating it in order to destroy SR-388 as well. In a final battle where the encounters both SA-X and an Omega Metroid, Samus energes victorious, redirects the orbit of the station, and escapes on her ship before the station detonates and collides with the planet, obliterating both. The Metroid Prime series consisted of five installments released between 2002 and 2007 for the Nintendo Gamecube, the Nintendo DS, and the Wii. In 2009, three of the titles were released with enhanced motion controls in a compilation for the Wii called the Metroid Prime Trilogy. Metroid Prime was released on the Nintendo Gamecube in 2002. It was the first game to introduce the first-person 3D perspective used in later installments. Chronologically, it takes place shortly after the events of the original Metroid. Samus responds to a distress beacon from the Space Pirate research Frigate Orpheon, orbiting planet Tallon IV, where the pirates were experimenting on lifeforms using a mutagenic substance known as Phazon. On the frigate she encounters the cybernetically-enhanced Meta Ridley, who escapes to the planet's surface. On Tallon IV, Samus discovers the ruins of a Chozo civilization that had been obliterated by a Phazon-laced meteor, which devastated the ecosystem. She aims to enter the Impact Crater of that meteor, the entrance of which is blocked by the Artifact Temple, and destroy the source of the Phazon there, dismantling Space Pirate mining and research operations as she goes. After collecting the 12 Chozo Artifacts needed to release the cipher at the Temple and enter the crater, Samus encounters a severely mutated Metroid known as Metroid Prime. Though she emerges victorious, Metroid Prime survives and is reborn with DNA it stripped from Samus's Phazon Suit during their final battle. The second game in the Prime series, Echoes was released in 2004 for the Nintendo Gamecube as a direct sequel to Metroid Prime. Chronologically, Metroid Prime Hunters takes place between the two titles, but is not connected to the main storyline. Samus visits planet Aether to render assistance to a squadron of Federation Troopers with whom the Federation had lost contact. Upon arriving, she found the squadron dead and the planet embroiled in a transdimensional war between the native Luminoth of Aether, led by the sentinel U-Mos, and the amorphous Ing of Dark Aether, a twin planet born of Aether when a Phazon-laced meteor, not unlike the one that impacted Tallon IV, collided with Aether. The Space Pirates had also come to Aether, drawn by the Phazon from the meteor. Finally, Metroid Prime, reborn as Dark Samus, was also drawn to the planet. Facing enemies on all sides, Samus races to save the Luminoth and their collapsing homeworld. Using Portals that connect the two dimensions, Samus recovers the planetary energy stolen by the Ing from Dark Aether, weakening it to the point of collapse. After defeating the powerful Emperor Ing and Dark Samus, Samus Aran restores Aether to its former glory and bids the recovering Luminoth farewell. In the final cutscene, Dark Samus is seen reforming in space. Released in 2005 for the Nintendo DS, Metroid Prime Pinball is a retelling of the events of Metroid Prime as a series of pinball adventures. Hunters was released for the Nintendo DS in 2006. 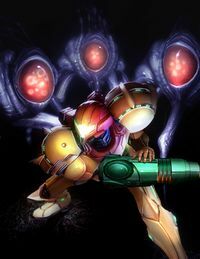 Chronologically, the game takes place between the events of Metroid Prime and Metroid Prime 2: Echoes, but is not connected to the main Prime series storyline and is not involved in the Trilogy. Samus is hired by the Federation to track down and capture -- or if necessary destroy -- the source of a Neural Thread from the Alimbic Cluster in the Tetra Galaxy containing a message that speaks of an "ultimate power." That message was also intercepted by other Bounty Hunters, who attempt to acquire it for themselves. In the Alimbic Cluster, Samus recovers artifacts called Octoliths left behind by the Alimbic civilization, and warnings against a creature they imprisoned called Gorea. Gorea is actually the source of the message, intended to lure others who could release him from that prison. Though Samus intends to destroy Gorea, other Hunters reach him first, tempted by the draw of ultimate power. Using an Alimbic weapon called the Omega Cannon, Samus manages to destroy Gorea, ending the threat once and for all. This page was last edited on 17 October 2017, at 19:35. This page has been accessed 79,531 times.